‘Can & Hose’ to the rescue! For high-concentration intake and upper engine cleaning and/or seasonal engine storage, mix 1 part Sea Foam to 2 parts fresh fuel in a small fuel can. Note: Less than one can of Sea Foam is providing the same cleaning ratio as adding 40 cans of Sea Foam to 10 gallons of fuel for a small fraction of the cost. With a water cooling source circulating through the engine’s water inlet (always while running), start and run the engine for 5 minutes to heat the intake. 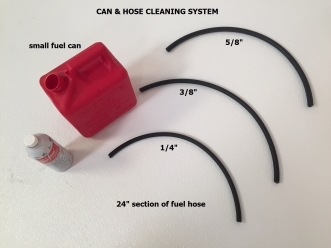 Disconnect the main fuel line (upstream) from the primer bulb, then attach the short section of hose. Insert the open end of the hose section into the Sea Foam and fuel mixture. Start the engine and run for 15 minutes. Shut off the engine for 5 minutes to all the Sea Foam mixture to ‘hot soak’ in the chambers. Start the engine and run for 5 minutes to burn off the dissolved hydrocarbon residues. After running, shut off the engine and reconnect your main fuel line – all done! Pour the remaining can mixture in the tank or use for other engines. 1 pint of Sea Foam mixed with 2 pints of fuel will treat several outboards. If you’re preparing the upper engine for seasonal storage, Sea Foam will help to lubricate and help protect the intake and chamber areas during the storage season. For an added measure of lubrication, pull the spark plugs and spray a 3-second burst of Sea Foam Spray into each cylinder cavity. It’s that simple!